LOT Publications Webshop. How stressful is L2 stress? How stressful is L2 stress? This dissertation addresses the second language (L2) acquisition of word stress in production and perception, from both a phonological-theoretical and psy­cholinguistic angle. It investigates how cross-linguistic differences in the (types of) metrical systems of native speakers of a variety of first (native) languages (L1) affect the L2 acquisition of word stress. This includes the differences in the formal properties of L1 and L2 stress and the functional properties of L1 stress, and their implications for the representation of stress in the mental lexicon established during the L1 acquisition process. To this end, native speakers of several languages were tested experimentally for their L2 perception and pro­duction of Polish word stress. These languages were Russian, Czech, German, French, English, Spanish, Italian and Chinese. This thesis contributes to a better understanding of adult L2 acquisition of stress, the relationship between L2 perception and production, and the effects of L1 properties on the acquisition of L2 stress. 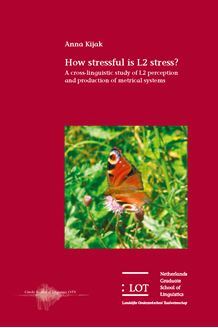 As one of its most important features, this dissertation addresses the complexity of the (L2) stress perception process, suggesting that the function of L1 stress (in terms of facilitating word recognition or word segmentation) should be included in the properties affecting speakers’ stress perception. This dissertation will be of interest to those working in the area of phonology, second language acquisition and psycholinguistics.